Fitzgibbon, Constantine. Watcher in Florence. Fitzgibbon, Constantine. Watcher in Florence. 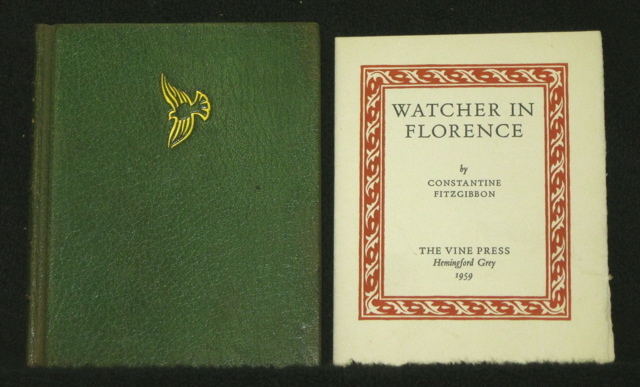 Hemingford Grey: The Vine Press, 1959; limited to 150 copies on Millbourn hand-made paper, signed by Fitzgibbon; 12mo, 63,  (colophon) pp., publisher’s gilt stamped full green morocco with raised bands to spine, very minor darkening to the extremities, else fine; accompanied by the publisher’s tri-fold prospectus.